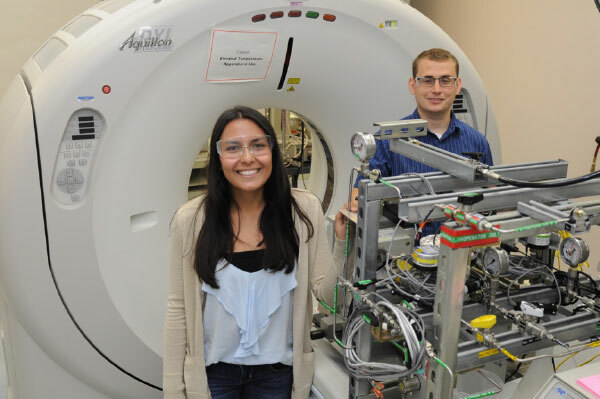 As a participant in DOE’s Mickey Leland Energy Fellowship (MLEF) Program, physics student Nicola Peyko studied the reaction of Marcellus shale fractures after injecting them with carbon dioxide alongside her mentor, Jonathan Moore . Her research will improve knowledge of the carbon sequestration process. To change the course of global warming, researchers are seeking methods to mitigate the release of greenhouse gases into the atmosphere. One method, carbon sequestration, involves capturing waste carbon dioxide and preventing its atmospheric release by placing it in a storage site, often located underground. Nicola Peyko, a Mickey Leland Energy Fellowship (MLEF) Program participant, was given the task of determining how the Marcellus shale, a unit of sedimentary rock that spreads across eastern North America, would react when injected with carbon dioxide. Alongside her mentor, Jonathan Moore, at the National Energy Technology Laboratory (NETL) in Morgantown, West Virginia, Peyko used computerized tomography (CT) scans, flow data and X-ray diffraction data to analyze how fractured samples of the shale would respond under “reservoir-like” conditions when exposed to carbon dioxide. They were particularly interested in whether the fractures would swell. This project required a variety of advanced software processing techniques such as ImageJ and Ilastik to determine the efficacy of extracting fracture data from the CT scans and relating the data to the hydraulic results. Peyko applied to the program because of her interest in energy research. Also, she wanted to learn the structure of national laboratories and observe the range of studies being conducted.